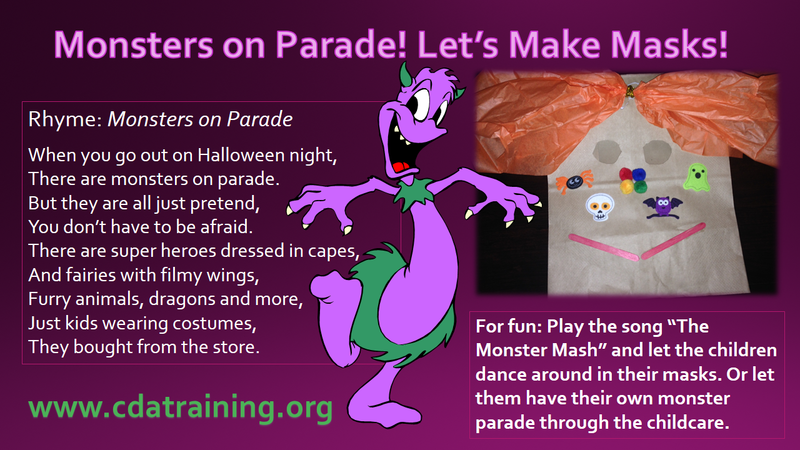 Child Care Basics Resource Blog: Monsters on Parade! Let’s Make Masks! Materials needed: Masks or large paper bags, odds and ends, ribbon, different types of paper or material, glitter, markers or crayons, glitter, scissors, glue. Pictures of children in costume. Directions: Cut eye holes in the masks or bags so children can see through. Let them decorate their masks as crazy as they like. Instructions: After the children have decorated their masks (Let dry) take pictures of each child in their mask, and without the mask. Print out, glue to one piece of paper and make a bulletin board display. Or glue to a piece of paper and let them draw a picture of what they will do in their masks and write it down beneath their picture. For fun: Play the song “The Monster Mash” and let the children dance around in their masks. Or let them have their own monster parade through the childcare.